On March 23 the State Archive in Warsaw hosted a delegation from the Iraq’s archives, represented by the Head of the Naional Library and Archives in Iraq – Mr Alaa Abo Al Hassan Esmail. We have got a pleasure to show our quests some records from the collection of 72/25 Warsaw Reconstruction Office („Biuro Odbudowy Stolicy”), about destruction of the city and its rebuilding. On January 26, 2018, Professor Tomoki Takeda from the Daiko Bunka University in Tokyo visted the State Archive in Warsaw. Professor Takeda is currently teaching History of Japanese Politics and Diplomacy, International History and Japanese Politics at Daito Bunka University, Department of Political Studies, Faculty of Law. His research interests is also closed to documentation and archiving of historical materials of modern Japan. After being welcomed by the deputy of the Director of the State Archive in Warsaw Mrs. Anna Wajs, Prof. Takeda heard a presentation about the history of our institute and he was familiarized with our structures. Most interesting and precious archival units were presented to our quest, including the records from the Archive of Warsaw Reconstruction Office (BOS archive), which belongs to UNESCO Memory of the World program. Presentation of old Warsaw photos was accompanied with the archival movie of Warsaw restoration which provided testimony of a nearly complete destruction of the city and its rebuilding. Finally, Prof. Takeda found a time to talk with our staff and he got an information about our current projects. 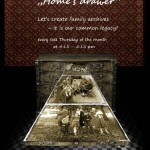 We would like to invite everyone interested in genealogy and their family archive. Our archive is open for everyone who wants to start his or her research, on the last Thursday of every month. We will teach about record preservation and explain how to start your home archive. Our staff will help start your genealogical journey. Do your research together with us! On November 27-29, 2017 representatives of Opplandsarchiver Adveling Maihaugen in Lillehammer visited Polish institutes as a part of the bilateral program. This visit was preceded by the delegation of Polish archivists on November 20-21, who acknowledged with Norway’s archival organization. Our guests had an opportunity to familiarize themselves with the activities of the Central Archives of the Historical Records in Warsaw, the National Digital Archives and the State Archive in Warsaw. Norwegian archivists were invited to see our interiors where they have seen most interesting archival collections and technical devices for digital works. They have been also particularly interested in the current projects realized by the State Archive in Warsaw. As the result of these meetings important contacts were maintained for the further exchanges of experience and discussion about methodological issues.